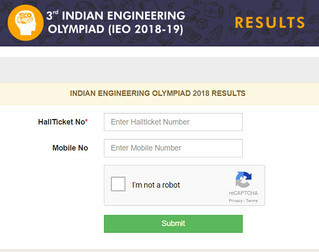 Indian Engineering Olympiad Results (IEO) has been declared on 28 March 2018 at the official website of IEO. This Olympiad is organised for measuring the skills & knowledge of students in various engineering fields. After the declaration of Indian Engineering Olympiad Results 2018, selected candidates will get prizes according to their ranks. IEO is conducted by Think cell Learning Solutions Pvt. Ltd. Earlier the website stated that the result will be declared on 24 March but now it has been declared on 28 March and you can check your result by following the given link. The result of Indian Engineering Olympiad 2018 has been declared on 28 March 2018. Candidates can visit the official website of IEO to view the results or click the following link. After the declaration of Indian Engineering Olympiad Results, selected candidates will get prizes according to their rank. Candidates will be selected on the basis of examination of Indian Engineering Olympiad which was held on 25 February in more than 65 centres across India. Those students who performed well in this examination will get various prizes according to their ranks.